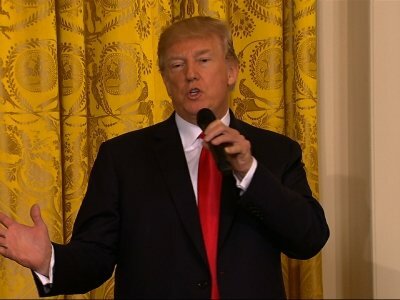 WASHINGTON (AP) — President Donald Trump said Thursday the “ultimate penalty” may be in order for drug dealers because the nation’s drug problem will never be solved without a show of strength and toughness. In remarks Thursday at a White House summit on the opioid epidemic, Trump said drug dealers and pushers kill hundreds of people but that that most don’t go to jail. “You know, if you shoot one person, they give you life, they give you the death penalty. These people can kill 2,000, 3,000 people and nothing happens to them,” he said, referring to drug dealers. Trump also held out the possibility of initiating federal lawsuits against opioid makers and distributors. He also said his administration will be “rolling out a policy” on opioids in the coming weeks that will be “very, very strong.” Neither he nor his aides provided any details. Trump said he had spoken with Attorney General Jeff Sessions about suing opioid makers. Sessions announced this week that the Justice Department will support local officials in hundreds of lawsuits against opioid makers and distributors. Opioids, including prescription opioids, heroin and fentanyl, killed more than 42,000 people in this country in 2016, more than any year on record, according to the Centers for Disease Control and Prevention. Trump has declared that fighting the opioid epidemic is a priority for the administration but critics say the effort has fallen short. Trump in the past has addressed the issue of tough penalties for drug dealers and pushers. In January, Trump said: “We’ve never had a problem with drugs like we do, whether it’s opioid or drugs in the traditional sense. It’s never been like it is. Trump raised the issue later that month as he signed legislation giving Customs and Border Protection agents new resources to stop the illicit drug flow. He suggested that he’d like to take a more aggressive approach to the drug crisis — but said the country isn’t ready for what he has in mind. “So we’re going to sign this. And it’s a step. And it feels like a very giant step, but unfortunately it’s not going to be a giant step, because no matter what you do, this is something that keeps pouring in,” he said.